The 25th Japan Society for International Development (JASID) Annual Meeting was held at Chiba University in Japan from November 29 to 30, 2014. From Ogawa seminar, Prof. Keiichi Ogawa and two of his students, Mr. Masahito Motokawa and Ms. Meng Xiaodong participated in this annual meeting. During the council meeting, Professor Ogawa was inaugurated as the Secretariat General of the JASID and served as chair for the “Education and Human Capital” session. On the day before the annual meeting, we (Prof. Ogawa, Mr. Motokawa and I) arrived at the Institute of Developing Economies (IDE), where the 8thSecretariat of JASID is located. The outgoing chairperson of the secretariat, Mr. Ikegami briefly introduced the primary contents and processes of the secretariat’s work. Later we joined in making preparatory arrangements for the two meetings mentioned above, with guidance from Ms. Tsuruoka, the outgoing JASID part-time staff. 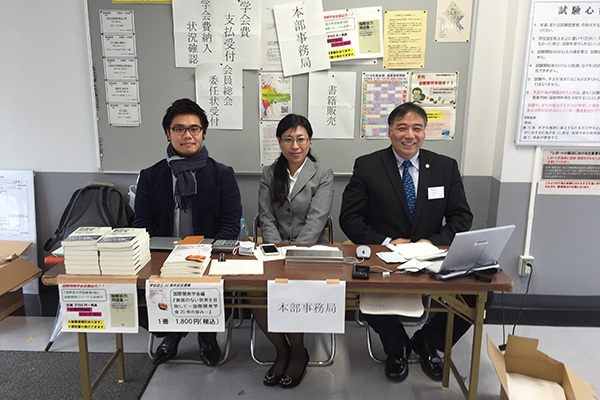 The 25th National Annual Meeting of JASID was held 29th November 2014 in the School Hall, and it involved us setting up a booth within the Conference Theater of Chiba University in order to serve JASID members. Our roles included accepting payment of membership fee, providing receipts, updating membership registration information according to the member’s personal requirement, retrieving IDs and passwords for members and selling academic publications. In addition, we were in-charge of arranging the meeting room for the 74th JASID Board of Directors’ Meeting, taking meeting proceedings, making corrections and addition for the meeting materials and preparing food and drinks for the administrative committee members. The Managing Board of Directors’ transfer from the 8th session to the 9th session was successfully completed and was crowded with a reception party. The 74th General Meeting of the new Managing Board of Directors was held 30th November 2014 at the General Education Center. The meeting was attended by 12 board members, who exchanged ideas regarding common concerns, such as how to manage the secretariat efficiently, how to promote academic study results of JASID members and how to develop JASID affairs. The participants then confirmed some basic rules, including the manager of Homepage, management method of admission to and withdrawal of JASID membership, and payment channels of membership fee. Mr. Motokawa and I attended the National Annual Meeting of JASID meeting as working students and it was our first time. We took part in coordination and reception activities, which was a challenge for us. Luckily we got much encouragement and support from Mr. Ikegami, the Chairperson of the 8th Secretariat. We learnt and experienced the process of running an academic association and the flows of secretariat staff through working together with former part-time staff. With this valuable experience, we will devote our efforts to working for the principle office of the new Board of Directors.